I sit here in my room, on my bed, with my trusty 'ol NES fired up and a game of Super Mario Bros. going. As all of this is happening, I can't help but begin to feel a bit nostalgic. 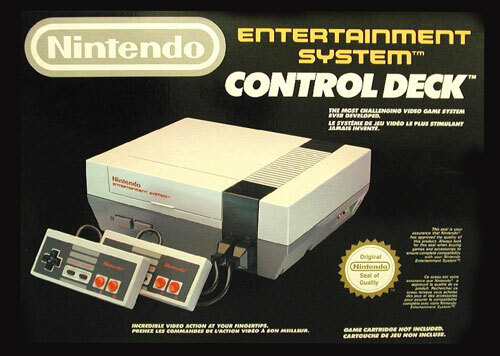 I all of a sudden realized that I have owned my NES since right before I started high school. I graduated last Friday. Where the hell has the time gone? All of this makes me reflect upon my gaming past. And if you'll indulge me, I'd like to sit here and give you a short history. When I was just a young lil NESman, (Before I actually ever played an NES, so I was more of a lil SNESman, but I digress), I loved video games. For the longest time, we owned no video games in our house, save maybe those little childish, yet awesome, LCD games. However, we did have access to a Sega Genesis over at my grandmother's house, so we played that when we could. Soon after that, we finally got a SNES in our house!!! Even after that, because we didn't have many games, I continued to play the Genesis (Lay off! They had both Sonic and Sonic 2, what more could you want?!). Well, as time went on, I finally got my very own system that I could call mine when I was six. On my sixth birthday, I got a Sega Genesis 3. Well, then I ended up finally getting a Playstation, then a PS2, about 2 years ago. I have acquired these classic games of the last 4 or so years, except for the Genesis model 2 and 3 that are the self same ones that I've owned since I was but a lad. I know this was probably a total waste of my time and your time, but I felt the need to do it. It's weird to sit and play a game and have it make me look back and reflect. However, since I have graduated high school and am going off to college in the fall, I have to look back and realize how fun a time I had with all of these video games. Chances are, I'll never let them go.